A century ago today(Aug 8th), more than 1,000 soldiers of the 20th Battalion, precursor to today's Queen's York Rangers, scrambled out of their trenches just east of the northern French city of Amiens in an offensive that broke the German Army and led directly to the end of the First World War. “At 0420 to the moment a blaze of crimson lighted the whole horizon behind us for miles. Three seconds later there was a deafening roar from hundreds of guns,” one soldier wrote home after the battle. “It was impossible to distinguish the sound of the individual guns, but rather the concussion resembled the throbbing of an engine built to drive a planet on its course. The Rangers were on the far left of the Canadian advance that day, with the Australians to their north. Lt.-Gen. Arthur Currie, the Corps commander, had elected to attack with two of his four divisions up front, because of the tight space within which he had to manoeuvre – his frontage was less than eight kilometres. His two remaining divisions followed close behind the 1st and 2nd Canadian divisions, ready to leapfrog forward once the first objectives had been achieved. The Canadian assault had achieved nearly complete surprise, thanks to elaborate precautions – including having the motto: “Keep Your Mouth Shut!” printed on the soldier’s pay books – and a successful deception plan that convinced the Germans that the feared Canadian Corps was still on the Belgian front, hundreds of kilometres away. A handful of Canadians had been sent to Ypres, far to the north, to send out radio traffic and mount patrols and raids wearing the distinctive Corps patches – all to convince the German high command that the Canadians were in Belgium. By this time in the war, the Germans had realized that the presence of the Canadian Corps was an almost certain sign of a coming attack. The entire Canadian Corps, more than 100,000 soldiers in all, marched 70 kilometres from their positions in the Arras sector to their assembly areas around Amiens in complete secrecy. The soldiers marched at night, taking cover during the day to avoid being spotted by German reconnaissance aircraft. The RAF even flew heavy bombers back and forth along the front so that the noise from their engines would drown out the rumble of heavy artillery rolling down the roads. “The roads were crowded with transport, and greetings passed between units from Vancouver, Winnipeg, Ottawa, Toronto, Hamilton, Montreal and Halifax,” said Capt. Robert John Renison, chaplain for one of the Canadian Corps battalions. The 20th battalion set off after dark on the 3rd of August, on a two-day march to their assembly area for the battle to come. “The night was fine, the roads good, and splendid time was made,” the war diary noted. On the 5th, they took over the trenches held by an Australian battalion just outside the village of Cachy, 10 kilometres west of Amiens, a tiny village left a burnt out ruin by four years of fighting, its buildings empty shells of brick and stone pockmarked with bullet holes and filled with rubble. “It rained all day,” the battalion war diary noted glumly. The soldiers settled into the routine of trench warfare made themselves as comfortable as they could in their dugouts and ‘funk holes,’ manning the parapets and observation posts and waiting restlessly for three days for the battle they all knew was coming. The officers were kept busy travelling to and from brigade and battalion headquarters to receive orders for the offensive and draw up their own plans for the attack. At 0420, the sudden artillery barrage that signaled the start of the attack opened up on the Germans, who were taken by surprise in part because there had been no preparatory artillery barrage – a fixture of most First World War offensives. As the men of the 20th Battalion advanced towards the first line of German trenches, the creeping barrage moved ahead of them, just as it had more than a year earlier at Vimy Ridge. Soon after the assault began, Germans began surrendering en masse. “Within a mile the prisoners began to appear, running unarmed from shell hole to shell hole, shouting ‘Kamarad,’ as they lifted both hands to any approaching soldier,” Capt. Renison wrote. By nightfall, 8,000 Germans had given up to the Canadians, and 17,600 were captured in total. The 20th captured the town of Marclave, five kilometres behind the overrun German front line, including an entire German headquarters taken intact by the Battalion Scout platoon. Casualties were light by the standards of the First World War: 20 killed, and 133 wounded. The next day, the Rangers were on the move again, as the Canadian and Australian attack threw the Germans into headlong retreat. 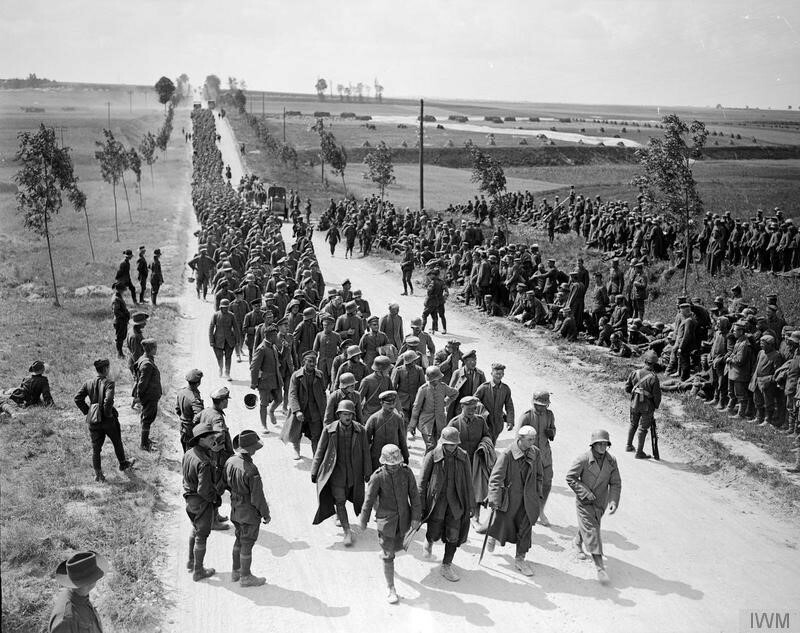 They marched to Rosieres, 30 kilometres east of Amiens, where they found a rare situation in the static fighting of the Western Front: no trenches to occupy. The Canadian Corps had penetrated so far into the German defences that they were in undisturbed ground. “Everyone had to set to digging in immediately on arrival,” according to the war diary. In three days of long marches and hard fighting, the Canadian Corps had dealt the Germans their worst defeat of the war. The Canadians penetrated up to 15 kilometres into the Germans’ rear area – a spectacular achievement in a war where advances were often measured in metres – taking 5,033 prisoners and capturing 161 guns. Three German divisions were shattered by the attack, losing so many men killed, wounded or captured that they effectively ceased to exist. When he informed Kaiser Wilhelm II of the disaster at Amiens, the Kaiser replied: “We have reached the limits of our capacity. The war must be terminated.” For the first time, the Germans made peace overtures to the Allies. 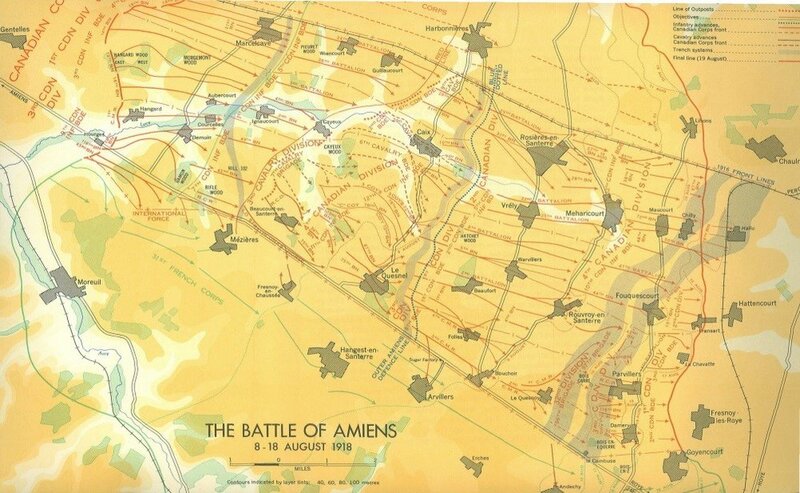 Indeed, Amiens was the opening shot in what became known as the Hundred Days campaign, the Allied push that drove the Germans backwards until their ultimate defeat, and which led directly to the armistice on November 11th. And the spearhead of that 100-day drive was the Canadian Corps, with the Rangers – as always – in the thick of the action.